A side-project of Epica mastermind Mark Jansen, Mayan move away from shapely-redhead-fronted operatic metal towards a mildly heavier, gruntier, more masculine form of symphonic stomp. Joined by various members of Epica and a few others (ex-Delain bassist Rob van der Loo, Symmetry guitarist Frank Schiphorst, ex-After Forever keyboardist Jack Driessen) Jansen presents an album that has sod all to do with the ancient civilisation that the band takes its name from, but just about manages to make a convincing argument for its own existence. Mixing death metal with symphonic influences is something rarely tried, probably with good reason, yet any doubts I had pleasantly vanished on actually hearing the music. Opener Symphony Of Aggression is a good example of this, a sort of Hypocrisy-gone-prog vibe notable as it mixed technical death metal with Nocturnus-esque keyboards, only for clean male/female vocals pop up for a beauty-beast formula that’s biased in favour of the beast. Yes, although guest spots from Simone Simons, Floor Jansen, Metalium’s Henning Basse and a few others (such as Amanda Somerville, who’s been on Kamelot and later Avantasia albums) are present and correct, this really can’t be dismissed as the usual gothic metal drama-thon. If you’ve ever listened to an Epica album and wished that Simone would spend more time powdering her nose than singing whilst the rest of the band went in proggy directions, well, this album’s for you. Unfortunately, since these typical gothic-y moments do still appear quite often and the songs are structured in a fairly gothic metal style, this can make the album seem rather unbalanced, moments of instrumental technicality merely making the wait for that elusive chorus longer. I’d accuse Jansen of not knowing whether he wants to be master of one trade or jack of them all, except for the fact that his choice has quite clearly been made – he wants to pack as much as possible in, from the keyboard proggisms on Mainstay Of Society to the snarls and death metal meanderings of Course Of Life, uncannily reminiscent of latter-day Death. There are even hints of Dimmu Borgir-esque black metal on The Savage Massacre, oddly mixed with clean-sung sections that would sound more at home on an Ihsahn album. The ingredients are therefore all present and correct, and anyone with a love for gothic or symphonic metal of the Nuclear Blast kind will find plenty of enjoyable moments. One negative I must point to, however, it is the songwriting, and the way that these moments are put together. 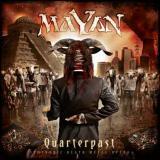 Few bands have the audacity to blend prog, goth and symphonic elements together like Mayan has here. Unfortunately for Jansen, this is because such a mixture tends to sound like a haphazard mixture of its parts! Dream Theater, Therion and Epica are all recognisable in cut-up form, and if there’s a single thing that Mayan could improve upon, it’s in the way that these are put together. Make no mistake, however, as it is Quarterpast is an interesting and even engrossing album, one that I’d recommend to all, even as a suitably melodic stepstone to heavier pastures.